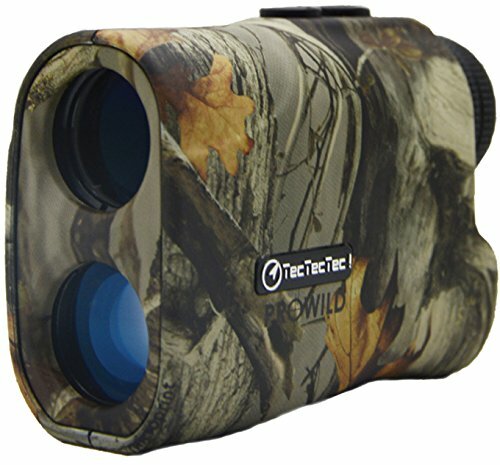 One of the top-selling rangefinders for hunting is the TecTecTec ProWild. TecTecTec is one of the newer names in optics and currently they focus only on (budget-friendly) rangefinders for hunting and golf. For hunting, in addition to the ProWild, the brand also offers the ProWild 2 and ProWild S.
The ProWild is appealing in particular because of its reasonable price. At under $100, the ProWild is a solid yet inexpensive rangefinder that measures up to 540 yards with +/- 1 accuracy. It’s weather-resistant and lightweight, weighing in at 6.5 ounces. While the display is easy to read, it isn’t illuminated. Using it is very simple, with a two button design that lets you measure speed or distance. The glass is good for the price — 6x magnification and multilayer coating. The device dimensions are 4″ x 2.8″ x 1.6″. Overall the ProWild is a decent wallet-friendly option if you’re in the market for a rangefinder. Reviews from buyers and pros are mostly positive, with some reports of defective units out of the box or at the year mark (TecTecTec does have a 2-year warranty on the ProWild). Some hunters have run into issues with reading accuracy, but this should fall under warranty. The original ProWild is a good starter or even a worthwhile option for hunters who don’t want to spend much on a rangefinder. However, there are two other models in this line that might be worth your attention. Let’s look at those next. The ProWild S is the next step up from the ProWild and is about $30 more. The ProWild S has the same basic setup as the ProWild — including max range, glass, and continuous scan mode — but it also has angle compensation which provides both actual distance and true ballistic distance for higher accuracy. The S looks nearly identical to the original ProWild and features the same weather- and dust-resistant build and quality glass. Early reviewers have found this to be lightweight and accurate. The final rangefinder in TecTecTec’s hunting rangefinder lineup is the ProWild 2. This one is about $50 more than the ProWild but boasts better total accuracy (within .3 yeards instead of 1), advanced technology, and some “high-end components,” as they say, versus the ProWild and the S.
The ProWild 2 also has a different look than the other two — a slightly different body build and a green color instead of camouflage. Essentially, the ProWild 2 is going to give you a better read and feel a bit more like a premium model. TecTecTec offers a 2-year warranty on all their products and is known for having good customer service. 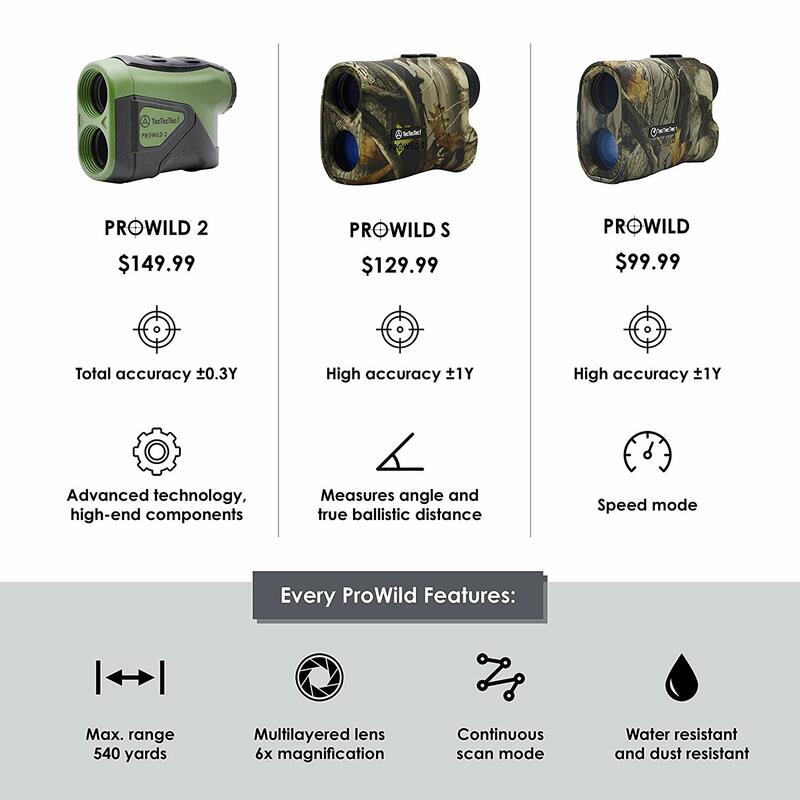 The ProWild series of hunting rangefinders offers three different models at just slightly different price points, so you can definitely find one that will fit within your budget and have the specs you need for the hunt. We like the ProWild 2 best out of the bunch because it has those additional features and better accuracy for under $150. Even so, each of these are lightweight and easy to use, so there’s really no bad things to say about any of these. TecTecTec is quickly making a name for themselves in the world of hunting optics, and these three rangefinders are good examples of why.